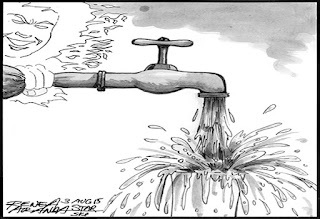 The Philippine Star - Opinion - 3 August 2015: El Niño is likely to be particularly bad this year, meteorologists warned last week, with the impact of the weather phenomenon expected to be felt in the final quarter of the year and possibly continuing until the first quarter of 2016. The public is being urged to conserve water as concessionaires warn that water supply is likely to be reduced. The warning may not register as El Niño brings heavier than usual rains this typhoon season and floods inundate many areas. But state meteorologists warn that once the rainy season is over, the nation could experience an unusually dry period in the last quarter of the year, with some areas...read on.